The 2012 IZOD IndyCar Series schedule will remain at 15 races, with the season-finale at the 2-mile Auto Club Speedway in Fontana, Calif., to be expanded by 50-laps/100 miles to a 500-miler. INDYCAR, the series ‘ Indianapolis-based sanctioning body, has been looking for a potential replacement event since June 13, when the inaugural street race in Qingdao, China, scheduled for Aug. 19 was cancelled. “After carefully considering all possible options for an additional race, we felt it was in our best interest to keep our schedule at its current 15-event lineup,” Randy Bernard, CEO, INDYCAR, said in a statement Monday afternoon. “We want to make sure that when we add events to our roster they have long-term potential and are given every opportunity to be successfully promoted. The more we explored, the more we felt like we were rushing what could be good, long-lasting opportunities for the sport. Road America’s 4.048-mile, 14-turn natural-terrain layout in Elkhart Lake, Wis., was rumored to be the leading replacement candidate as late as Sunday. But Bernard’s first choice was to offer a second race to Eddie Gossage, president of Texas Motor Speedway, in either late September or early October. Gossage declined on June 15 citing “numerous issues and obstacles” to overcome in promoting a second open-wheel race on short notice. TMS will play host to the AAA Texas 500 NASCAR tripleheader weekend Nov. 1-4, a pivotal event in the Chase for the Sprint Cup championship. 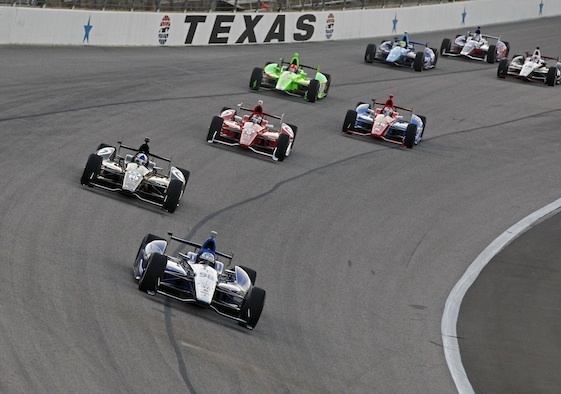 TMS’ high-banked, 1.5-mile quadoval played host to the IndyCar Series’ Firestone 550k night race on June 9, an event won by Justin Wilson of Dale Coyne Racing before an announced crowd of 69,000. It was the 23rd IndyCar event staged at the Fort Worth facility and most of any speedway in series history. Ironically, the race was run amid mounting speculation that INDYCAR might not return to TMS in 2013 because of issues related to safety and finances. TMS’ spot on next year’s schedule has yet to be resolved. The IndyCar Series has run annually at TMS since it opened in 1997, and two races were held at the facility from 1998 to 2004, including the season-finale on six occasions (1999-2004). IndyCar’s 2012 expanded season-finale will be run on Saturday, Sept. 15, on Auto Club Speedway’s D-shaped oval, where pole-sitter Dario Franchitti won the most recent open-wheel event on Oct. 16, 2005. That was the last of four consecutive IndyCar races contested at the facility located approximately 50 miles from Los Angeles. This year’s event will be televised by NBC Sports Network beginning at 8 p.m. (EDT). Series entitlement sponsor IZOD, a Heritage Brand in the PVH Corp. portfolio, voiced its support for the decision to cap the schedule at 15 events. “As the entitlement partner of the series, we agree that it is in the best interest of the series to focus on a long-term strategy for the future schedule instead of a quick fix for this year,” said Mike Kelly, executive vice president, The PVH Marketing Group. 1 _ Lap-led by James Jakes of Dale Coyne Racing on the 0.875-mile Iowa Speedway in Newton. It was the first time Jakes has led a lap during his IndyCar Series career…Driver to win the IndyCar Series title and at Iowa in the same season _ Dario Franchitti, who did it with Andretti Green Racing in 2007 and Target Chip Ganassi Racing in 2009. 2 _ Drivers to win back-to-back races in 2012 _ Ryan Hunter-Reay of Andretti Autosport and Will Power of Team Penske. 3 _ Points separating Will Power (286) from Ryan Hunter-Reay in the IndyCar Series point standings. 4 _ Podium finishes for Marco Andretti of Andretti Autosport at Iowa, including his season-best second-place result this year. 6 _ Different teams represented in the top-10 in the IndyCar Series standings. 7 _ Wins for Ryan Hunter-Reay in Indy-car competition. 10 _ Lead changes among eight drivers at Iowa, most this season outside of the Indianapolis 500’s record 34 lead changes. 13 _ Different drivers to finish on the podium in the first seven races of 2012. 16 _ Different drivers with at least one top-five finish in 2012. 20 _ Positions gained by Simon Pagenaud of Schmidt Hamilton Motorsports en route to his fifth-place finish at Iowa, most of any driver in the field. 28 _ Poles for Dario Franchitti, passing Al Unser for eighth on the all-time list. 136 _ Points scored on ovals by Ryan Hunter-Reay and Tony Kanaan of KV Racing Technology, who are tied for the lead in the A.J. Foyt Trophy standings. 190 _ Consecutive Indy-car starts for Tony Kanaan, dating to the 2001 Championship Auto Racing Teams event in Portland, Ore.